I had a very interesting conversation yesterday with a very well-known and prestigious attorney, someone who is also a dear friend. Our conversation shifted at one point towards art and the different characteristics of artistic expression. At one point he said to me, more or less, “I got stuck in classical figurative painting as something like a definition of what is art (he is something of a collector). I would love to understand more, but right now I have to admit that I find it too difficult to grasp or understand abstractions, expressionism, and other forms of avant-garde artistic expression”. Obviously the first thing that came into my mind is my friend imagining a happy chimp throwing painting on a canvas…which is obviously not what he meant, but one can only wonder if in the minds of many, and after so many years of exploring the boundaries of artistic expression, there is still an established image of elephants painting with their trunks and chimps throwing and eating paint as part of the abstract movement. I admit that, even if a great deal has been written over the years, it is still difficult to explain to someone what abstraction is all about, even if the word is pretty self-explanatory. My work is mostly, music inspired abstract expressionism, although some figurative interpretations filter in every now and again. In that regards, expressionism as an artistic form is a little easier to convey. For a start, the word itself implies a certain “intention” in what one does. Even if sometimes that same purpose may be obscure to most except the author, there is a primary objective of “expressing” something, be it feelings, textures, experiences, colors and so on. It can also be said that all art is an expression but that in itself, will only make my task even harder so I better not digress! But abstraction can be anything. A blank canvas is abstraction as much as one with hundreds of hours of work on it. The fact is that what is essential can be 99.9999999% of the original idea as much as 0.000000000001% (or less) of that same concept. So it is still a very wide notion and open to millions of interpretations. A more philosophical description could be that abstraction is the thought process wherein ideas are distanced from objects. I have had the wonderful experience of studying philosophy and I find this problem a great example of how difficult it is for us humans to accommodate to new paradigms (I am being very generous by calling abstract expressionism something new, but still it generates almost as much controversy today as when it first appeared as a mainstream form of artistic expression so many years ago). I have always loved that mental adventure that is finding the proverbial “Gordian knot” to every issue. So if I may, I am going to try to contribute to enlighten this rich and wonderful controversy (although most probably I will only add more complications to it!). If I may, I would simply say that for a figurative artist, his drawing of a certain scene, let us say one of the classical English hunting scenes made popular in the 18th and 19th Centuries, is in itself the end of the creative process. He or she will then work on his sketch, reproducing the colors, the shadows, the expressions of hunters, dogs, sky, fox and birds into a combination that will take you there as if you had been participating of that moment in time. His or her skills are amazing and the techniques used are a wonderful example of human ingenuity and artistic prowess. For an abstract painter who looks at the same scene, there may even be an initial sketch of similar characteristics. But that sketch, instead of being the final rendition prior to giving it life with his or her paints, it is just the starting point from where that painting and the painter are going. He or she will work from there into a new scene that may be devoid of many of the details, that may just rescue some shapes and colors, or simply express something devoid of form but which makes the viewer generate, for example, adrenaline and fear. And that may be the artist’s whole point. Wishing, perhaps, to generate in the viewer exclusively the emotions felt by the hunters and their horses, and perhaps the terror of the poor fox being chased in the woods. That also takes imagination, skill and a different set of techniques that will allow only the essence the artist is looking for to be left on the canvas, leaving everything else for you to explore and invent in your own mind. I don’t know if my explanation helps in any way, but I will ask my friend and I will let you know! So, to my work now. Here are 2 of my final works of 2011, both of them of the same size. 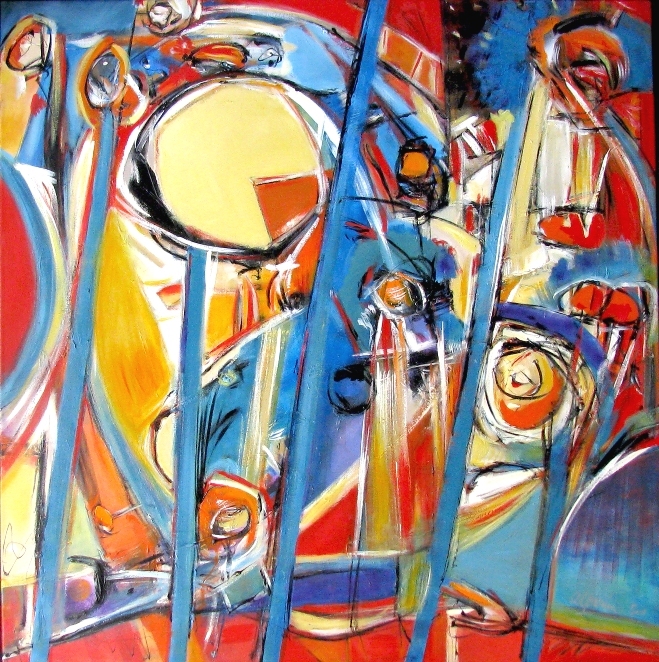 As a matter of fact they do have a lot of detail compared to many of my more abstract expressions so it is very fitting that they are shown here within this conversation about abstraction and figurative painting. The first one was started in 2010 and finished in 2011, and it is called “A winter flower garden”. 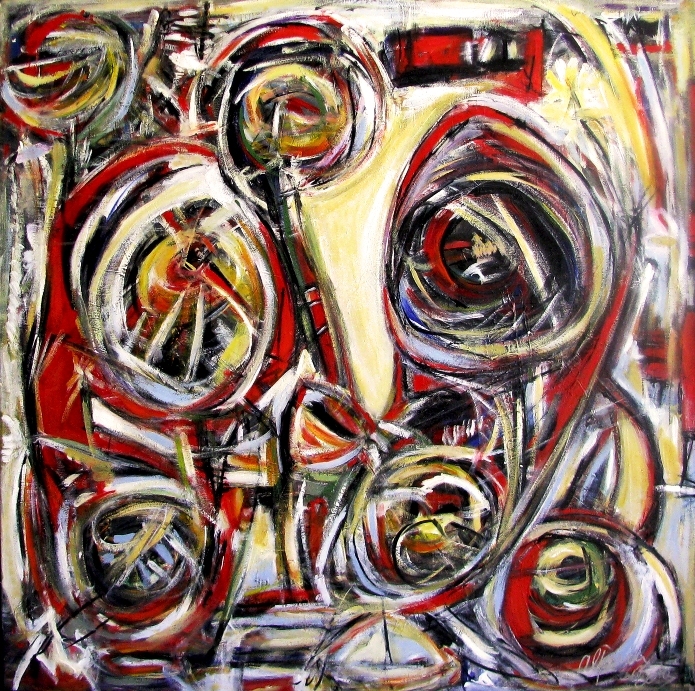 A 100cm x 100cm painting that I like very much. The second one is also lovely and it has a different feel to it, it is more like a scene after a spring shower went through it. It is also from 2011 and it is called “What a difference a day makes”, and it is based on Dinah Washington’s version of that wonderful song with the same title. You will see many things in common between both which were not really intentional, but make both paintings into a nice pair. I hope you enjoy them both, and the conversation that preceded them. ← A very puppy (and happy) Christmas!